I had a chance to hear Kim Diehl speak last October at the Utah Quilt Festival: it was great to learn details about her journey as a quilter and see her beautiful quilts. Her color choices and wonderful applique patterns can make any house look and fell like a cozy home. I was anxiously awaiting her newest book, "Simple Appeal", to add to my collection of her books, and was not disappointed! Gorgeous! The one on the bottom left corner is called "Farm girl finery" and it is my absolute favorite! 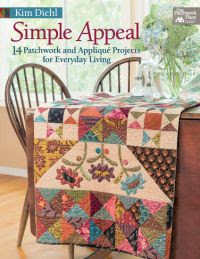 There are 14 projects in the book, along with useful tips for perfect block piecing and, of course, instructions for both wool and cotton applique, as well her machine applique method using monofilament. Another wonderful addition to my quilt library!!! Kim has the most wonderful style. Truly a talented lady.